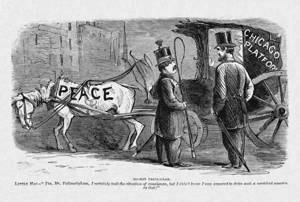 In this cartoon from Frank Leslie’s Illustrated Newspaper, Democratic presidential nominee General George B. McClellan (left) expresses surprise to Clement Vallandigham (right) over the poor state of the party’s horse, a weak animal named “Peace.” Drafted at the Democratic National Convention in Chicago, the party platform included an endorsement of a ceasefire and negotiated settlement of the Civil War. McClellan repudiated the peace plank and declared that he would administer the war more effectively than President Abraham Lincoln, his Republican opponent. Vallandigham was a former Democratic congressman who had been charged with treason and exiled to the Confederacy. He returned to Ohio in June 1864 and began speaking out against the war, but was ignored by Union officials. He was instrumental in the passage of the peace plank and campaigned for McClellan and other Democratic candidates.